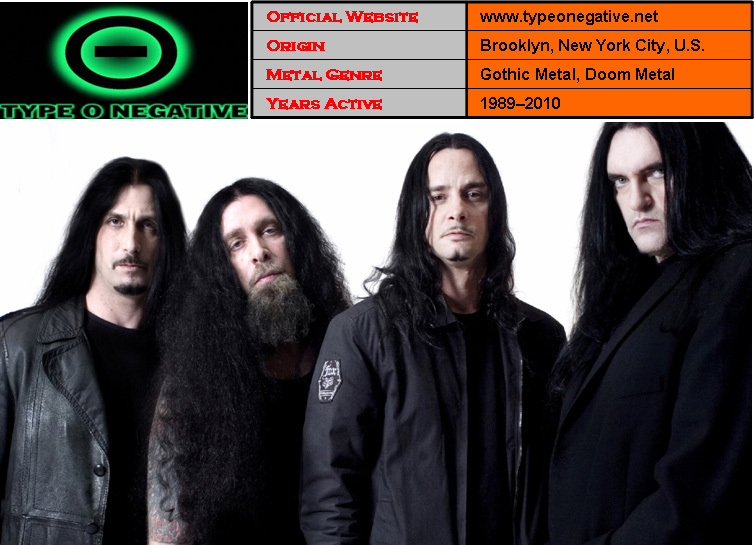 Type O Negative was an American gothic / doom metal band formed in Brooklyn, New York City in 1989. Their lyrical emphasis on themes of romance, depression and death resulted in the nickname “The Drab Four” (in homage to The Beatles’ “Fab Four” moniker). The band went Platinum with 1993’s Bloody Kisses, and Gold with 1996’s October Rust, and gained a fanbase through seven studio albums, two best-of compilations and concert DVDs. On April 14, 2010, lead vocalist, bassist, and principal songwriter Peter Steele died, reportedly from heart failure brought on by an aortic aneurysm. Members Kenny Hickey and Johnny Kelly stated in a November 2010 interview with French music magazine Rock Hard that the band would not continue.